Lets compare three different kinds of investments. The three investments are fixed interest investment, an investment that has its returns indexed to the stock market and direct investment in stock equities. Fixed investments are pretty simple. A good example of a fixed return investment is a bank CD or a bond. You buy the investment as an IOU and they pay you a specified fixed investment for the given time period. Theres no risk or minimal risk, but the returns are limited compared to riskier investments. Directly investing in the market is also fairly easy to understand. You take your money and buy shares in a mutual fund or index fund. If the market goes up you profit, if the market goes down you lose. Theres higher risk and higher potential returns. The averages are fixed = 5%, indexed = 5.27%, market = 8.1%. 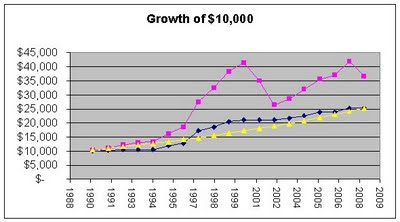 The maximum gains seen were fixed = 5%, indexed = 33% and market = 49%. 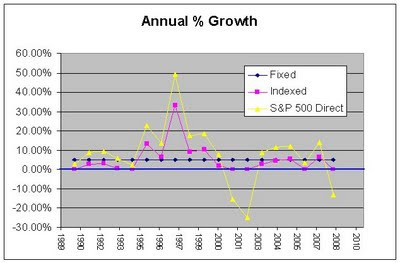 The minimum one year performances were fixed = 5%, indexed = 0% and market = -25%. So with the indexed fund you can experience up to 2/3 of the market returns but be guaranteed not to lose any principal. Would you take the indexed fund over the direct market? Given this explanation to me it seems tempting. As you can see the purple line representing direct investment in a S&P 500 index fund would have outperformed both the fixed and indexed investments. Probably more striking I think is how the indexed investment performed virtually the same as the 5% fixed investment. Given the investments described above the fixed and indexed investments end up about the same. I should point out that the dates picked were somewhat arbitrary. The figures are numbers and the market performance are meant for illustrative purposes to compare these styles of investment. Of course market returns can be better or worse than this example. If you bought in 1999 then held through 2009 then the fixed investment would have outperformed the other two alternatives and the indexed which would have beaten the direct index fund investment. Whether the markets perform well or poorly the returns from an investment that is indexed to the market are not likely to be better than a simple straight forward fixed investment.